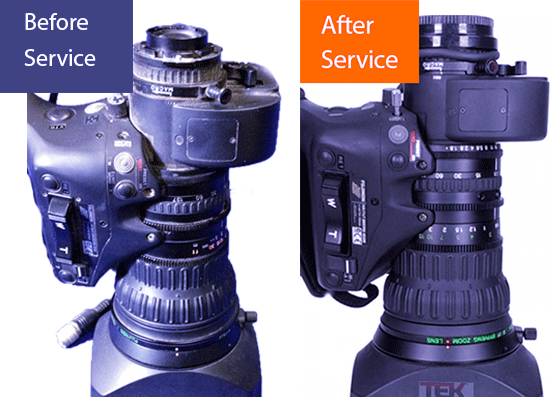 We provide a first class lens service and repair with a fast turnaround. 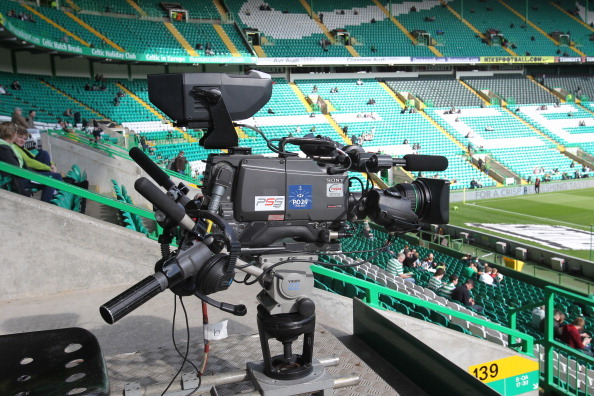 Our experienced lens technicians have a vast range of skills and experience with HD/SD broadcast, professional, industrial and film lenses. When we start with your lens, we will place your it in our clean room setting, equipped with HEPA air filters, ensuring a dust-free atmosphere. Manufacturer specifications guide our service with precision testing alignment equipment. The only manufacturer provided tools and software used during maintenance; while company recommended lubricants, securing compounds, and cleaning agents are used to ensure a factory specification on every lens we repair. We work with many film studios, production houses, TV stations, independent filmmakers and businesses across North America. With free lens repair estimates, free shipping, and confidence in our repairs, we warranty all our work for one year. 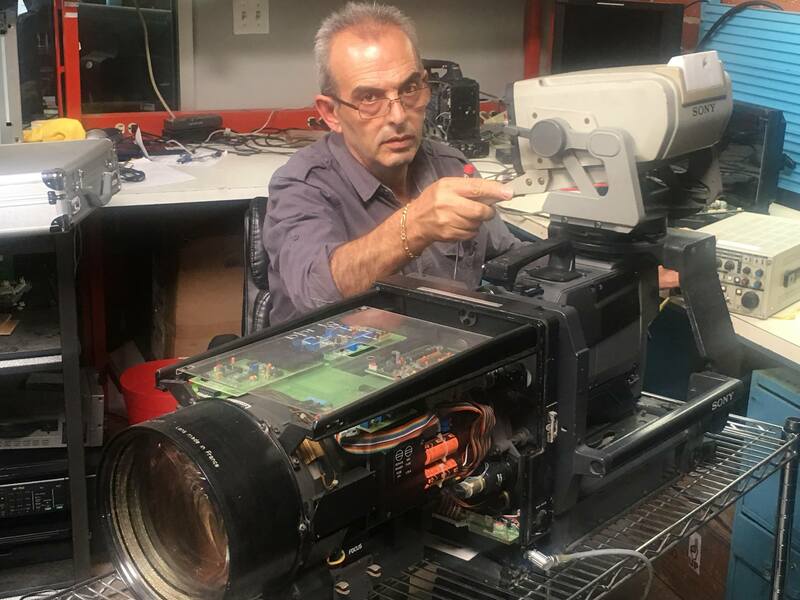 Being in business for over 20 years alongside years of combined technician skill, we have the knowledge and expertise concerning all your SD/HD, broadest, professional, and industrial and film lenses, chiefly, because your business relies on it. Service is based on manufacturer specifications with precision test and alignment equipment. Only manufacturers’ recommended lubricants are used, cleaning agents and securing compounds, ensuring that your lenses receive the best treatment possible. We are so confident on our service quality depends on the manufacturer, all our work will be warrantied up to one year. Accidents happen. Even the most ergonomically designed cameras matched with confident camera operators can still suffer unfortunate mishaps. While dropping a lens may not display any superficial damage to a lens glass or body, its delicate internals may be damaged. In the absence of any scratches, dents or scrapes, there will be some noticeable issue(s) if your lens has sustained damage. Whether that is a new and unfamiliar sound, apathetic body movement or distorted image quality, manifestation will take place in one of these areas. While a thin knife or needle nose pliers may help you position bent lens rings into a manageable working position, you may be causing more damage to delicate metal or circuits than it’s worth. 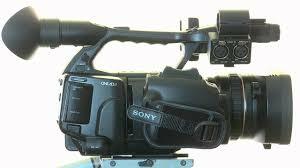 To guarantee your camera’s future potential, we suggest you bring it in for camera impact service. Backfocus - Out of focus - rings stuck any of the debris listed on this page can cause miscellaneous error, or simply make lens act sluggishly, jammed the rings can blur and stain your footage. Sand Damage can cause devastating effects on any Lens. Sand penetrating deep inside the systems through the rings. When inside, it seriously affects moving parts jam the rings, blur and stain your footage can also occur. This is usually signaled by grinding, grating and cranking in the manual and auto controls. Sand salt trapped inside can cause friction among moving and mechanical parts. 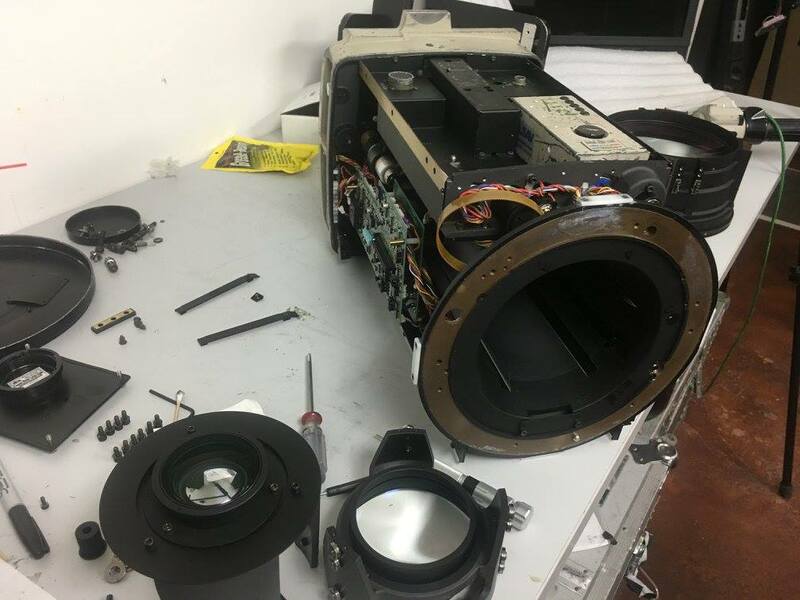 If the sand or salt has not caused permanent damage, your lens is defiantly repairable tedious work and time is required to clean and restore the unit. 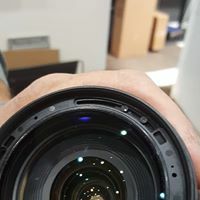 Typically seen as combination effect with water and sea salt damage, dirt and particle damage can be just as harmful to your afflicted camera and video lens. Similarly to water, particles will invade your lens body given the opportunity. While more visible and easily cleaned then water damage, sand and particles can still cause irreversible damage. Trapped particles will cause friction against all moving parts. Jammed lens rings, unsound noises, and a distorted image will be instantly recognizable when suffering from this infliction. Again, the only way to rid your lens of this nuisance is to take your optics apart and clean every piece carefully. Once clean, they will need to be put back together in correct order and then re-calibrated to factory spec. For these reasons, we suggest you leave this one to our professionals. 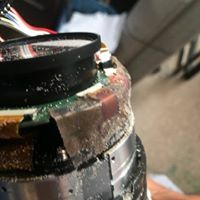 Fungus or Mold on Lenses although fungus contamination happens most often in warm tropical environments, it can also occur under any humid and warm conditions. Fungus is most noticeable in the lens, where it may cause the image to look hazy. Fine strands may be noticeable crisscross lens elements. Eventually, fungus strands infuse spaces and surfaces within and between the lens assemblies. If it’s been growing for a while, heavier spots develop at the junctions of the strands. The fungus etches into the lens coating and eventually into the glass as well. There are several entrances for water and sea salt to enter your camera's lens: screw holes, covers, seams. Being so close to the beautiful and internationally-known shooting locations such as at the Santa Monica Pier and Miami Beach, we at Tek Media Group notice a large volume of water and salt lens damage requests. You may wet your lens briefly, drop your lens directly into a body of water, or you may face the startling setback that water moisture or vapor, potentially carrying salt, has entered your now water-inflected optics. Be sure to wipe all visible water away and allow your optic to dry for several days. However, you are not in the clear yet. 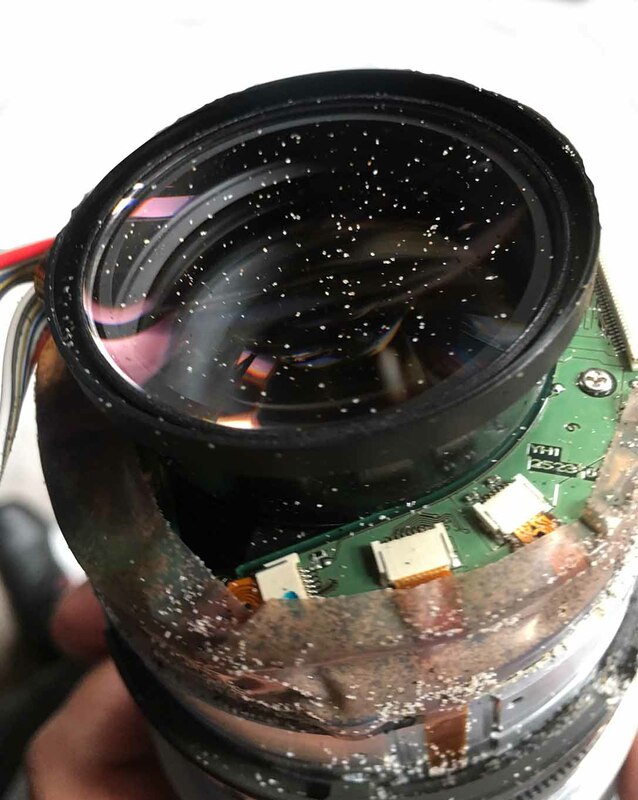 If any water, containing sea salt or not, remains in your lens body, it is very likely that the circuit board inside the lens may short and also that the iron in the board will begin rapid oxidation. If allowed to continue, this oxidation will decay the metal on the board, rendering your expensive optics useless. Small dust particles inside I have seen many optical lenses with some type dust particles inside good news as far as we could see it barely effects the shots and if does not for you might not want to warry about that for now.